Mar 11, 2013 by Stephanie W.
Steve Garnett from Ripple Rock (an IT consulting company that assists customers in improving their software development capabilities) is one of many who has experienced Technical Debt on a project he worked on in the past. His new blog post captures a common problem: you know the Technical Debt is there, you know that it’s going to be difficult to fix… so how do you convince management that you need the time and resources to deal with it? To answer this question you first need to understand if your Technical Debt is worrisome for your company or not. 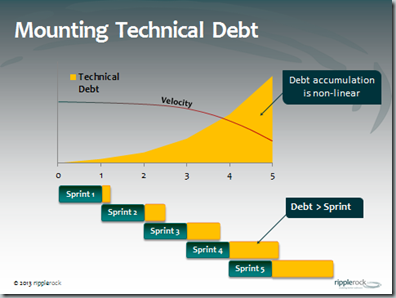 The quick answer is: Technical Debt is a problem when it starts to impede on your velocity. When this starts to happen, not only will it take you longer and longer to get into production, but your product will become less stable, your stakeholders and even you team will start to lose trust, and this will automatically impact the consumers. To this point however, I believe that not all Technical Debt is bad, and depending on your company’s needs it can be used as a strategic tool to gain a competitive advantage in the market. Steve recommends referring to Martin Fowler’s quadrant to help your company understand what is or isn’t acceptable for your organization in terms of Technical Debt. Compare the amount of times that the code will be touched over the next 6 months. An item of Technical Debt might have a very high interest but might only be touched once in the next 6 months. Does it make sense to fix that item or the one that has a lower interest but will be touched 10 times in the next six months? You can read the full blog post here which provides more details and slides – definitely worth the read!